Thank you for supporting our work by subscribing to our magazine and/or by purchasing individual copies. This is the print version our magazine which you will receive by US Mail. A pdf version is also available for instant download. 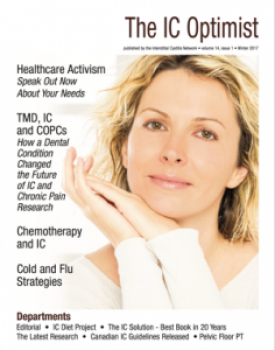 (1) Editorial: Healthcare Activism - Speak Out Now About YOUR needs - IC patients stand united in our need for compassionate and affordable health care coverage. We begin our Winter 2017 IC Optimist with an editorial that urges every patient to contact their elected representatives to tell them what services you expect to see in a national health care plan. Whether it be affordable prescription costs, coverage for pre-existing conditions or access to pain medication, we must speak out on this vital issue. 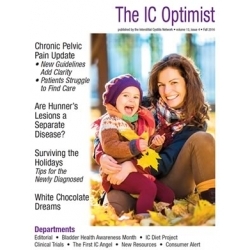 (3) Feature Story - Pelvic Floor Physical Therapy Treatment for IC/BPS - Former president of the International Pelvic Pain Society, Stephanie Prendergast, explains the how's and why's of pelvic floor treatment and why it's so important for many IC patients. (4) Why a "Diagnosis Isn't The Key to Recovery - Ms. Prendergast also discusses why having a complete diagnostic workup will help both the patient and their provider select the best treatments to use. (5) Feature Story - Proactive Patients Have Better Outcomes - It’s hard to be proactive during an IC flare. From calling your doctor to asking family members for help, it’s important that we communicate our needs. Stacey Shannon several tips on how to take care of yourself, talk with your physicians and just keep going! 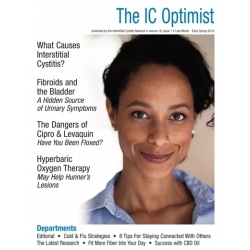 (6) Chemotherapy and IC: Hunner's Lesions Present Special Challenges - Can you imagine being diagnosed with IC and then, just a few months later, being diagnosed with breast cancer? In Joy’s case, her physician diagnosed Hunner’s lesions but didn’t treat them, which made her chemotherapy tragical- ly more painful. We share her experience, as well as insights from some of the best IC clinicians in the world! You can survive chemotherapy treatment when you also have a tender bladder but it takes both knowledge and preparation. (7) The IC Solution - The Best Book In Twenty Years - A new book by Nicole Cozean is, in our opinion, the best book written in decades and is the first to explain why the bladder, pelvic floor muscles and nerves are connected. If you're a newly diagnosed patients, this book is a must read. If you're a grizzled veteran, this may change the way you think about your IC and offer new treatment options. (8) The Latest Research - Several new studies have come out of interest including one that found more than 290 unknown metabolites in the urine of IC patients. Very thought provoking. We also share new biome studies for IC and IBS patients as well as two studies which review the effectiveness, or lack thereof, of DMSO as a treatment for IC. (9) Canadian IC Guidelines Adopted - Patients and providers in Canada finally have a set of national guidelines that should be used during both the diagnosis and treatment of IC. These are the first guidelines which encourage the use of subtyping for IC to determine the best treatment approach. Unfortunately, they didn't cover pain care. (10) Self-Help Tip: Cold & Flu Strategies For IC/BPS It's been a wicked cold and flu season so far. If you're not sure what you can safely use to help fight a cough or sore throat, we share some ideas suggested by other IC patients. (11) IC Diet Project: Slow Cooker Meals For Sensitive Tummies and Bladders - From the IC Diet Project, Julie Beyer RDN shares four fabulous slow cooker recipes perfect for these cold winter months! Stay inside, stay warm and enjoy these very comforting meal suggestions. We are very grateful for Javacid’s fabulous support for this project.